Author(s) Morand, Serge; Krasnov, Boris R.; Littlewood, D. Timothy J. The development of molecular tools has dramatically increased our knowledge of parasite diversity and the vectors that transmit them. From viruses and protists to arthropods and helminths, each branch of the Tree of Life offers an insight into significant, yet cryptic, biodiversity. Alongside this, the studies of host-parasite interactions and parasitism have influenced many scientific disciplines, such as biogeography and evolutionary ecology, by using comparative methods based on phylogenetic information to unravel shared evolutionary histories. Parasite Diversity and Diversification brings together two active fields of research, phylogenetics and evolutionary ecology, to reveal and explain the patterns of parasite diversity and the diversification of their hosts. 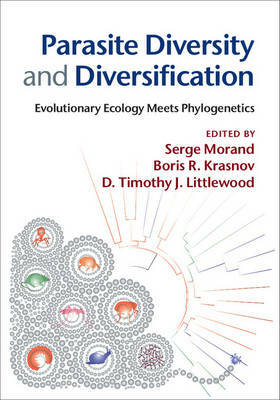 This book will encourage students and researchers in the fields of ecology and evolution of parasitism, as well as animal and human health, to integrate phylogenetics into the investigation of parasitism in evolutionary ecology, health ecology, medicine and conservation.